STAR WARS LAUNCH BAY — In the heart of Tomorrowland, Star Wars Launch Bay is the central locale for guests to celebrate all things Star Wars. Disneyland park guests are welcomed to this multi-sensory space with the iconic phrase, ÒA long time ago in a galaxy far, far away.ÉÓ Once inside, they may encounter beloved Star Wars characters, play the latest Star Wars interactive video games, explore galleries full of treasured memorabilia and authentic replicas of large-scale Star Wars artifacts, step into a Star Wars-themed cantina, and have access to Star Wars merchandise. (Paul Hiffmeyer/Disneyland Resort)ANAHEIM, Calif. – As the Force awakens at the Disneyland Resortdebuts Nov. 16, bringing exciting new experiences to Disneyland Park to celebrate all things . Adding to the annual Holidays season and the dazzling 60th Anniversary Diamond Celebration, Season of the Force in Tomorrowland will entertain fans of the famous film saga and guests looking forward to the future -themed land. ANAHEIM, Calif. – As the Force awakens at the Disneyland Resort, Star Wars Season of the Force debuts Nov. 16, bringing exciting new experiences to Disneyland Park to celebrate all things Star Wars. Adding to the annual Holidays season and the dazzling 60th Anniversary Diamond Celebration, Season of the Force in Tomorrowland will entertain fans of the famous film saga and guests looking forward to the future Star Wars-themed land. Among the elements entering this galaxy are Star Wars Launch Bay, an interactive space in the newly named Tomorrowland Expo Center; Star Wars: Path of the Jedi, a cinematic overview of the Star Wars saga; a new adventure in Star Tours – The Adventures Continue, and the reimagined attraction, Hyperspace Mountain. Opening Dec. 8, Jedi Training: Trials of the Temple enhances this popular show with new characters and a new villain. To further immerse guests in the saga, Star Wars-themed décor will celebrate iconic characters and moments from the films, and Star Wars-inspired food and beverage will be available. 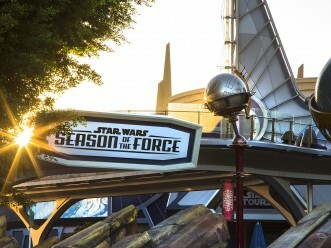 Season of the Force arrives just in time for the holidays, giving guests in Tomorrowland a glimpse into the world of the upcoming film, Star Wars: The Force Awakens, which is scheduled to premiere Dec. 18, 2015. The Holiday season at the Disneyland Resort runs from Nov. 13, 2015 through Jan. 6, 2016. Star Wars Launch Bay: In the heart of Tomorrowland, Star Wars Launch Bay is the central locale for guests to celebrate all things Star Wars. Guests will be welcomed to this multi-sensory space with the iconic phrase, “A long time ago in a galaxy far, far away.…” Once inside, they may encounter beloved Star Wars characters, play the latest Star Wars interactive video games, explore galleries full of treasured memorabilia and authentic replicas of large-scale Star Wars artifacts, step into a Star Wars-themed cantina, and have access to Star Wars merchandise. Special Character Encounters – After entering a themed atrium with authentic replicas of Star Wars props, guests may Journey to the dark side and come face to face with Darth Vader, or they may choose the light side by stopping in at a makeshift Rebel base to meet the most famous co-pilot in the galaxy, Chewbacca. Launch Bay Theater – Guests will hear directly from the creative minds behind the Star Wars saga in a short video that includes exclusive interviews with the directors, writers, producers and other key crew members who continue to bring the saga to life. The Cantina – This setting, inspired by the unsavory “hives of scum and villainy” in the Star Wars galaxy, is a fun place to explore and take photos near elements of the cantina, such as a holochess game table. Star Wars Game Center – Guests will play the latest and greatest video games, including Disney Infinity 3.0 with park-exclusive Toy Box levels. Themed Galleries – Special galleries will be located throughout Star Wars Launch Bay. 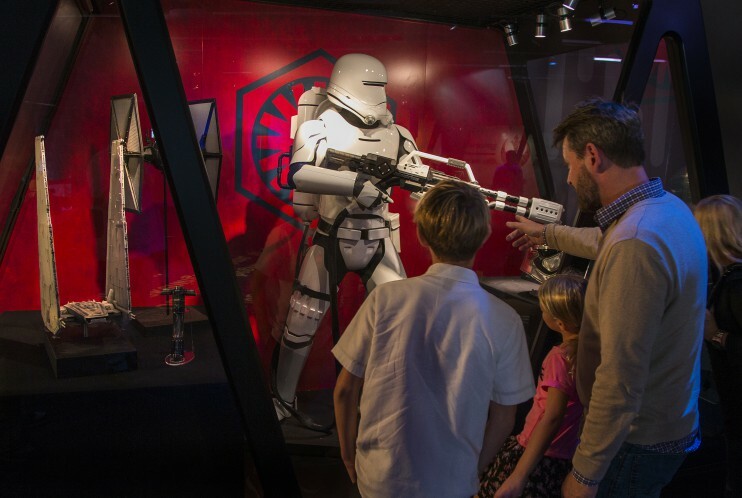 The Dark Side Gallery features pieces of Stormtrooper armor and Sith lightsabers. The Light Side Gallery displays rebel flight helmets and Jedi lightsabers. Authentic replicas of props and costumes from both the light and dark sides of Star Wars: The Force Awakens will appear in the Preview Gallery. Models of famous starships and their pilots will be on display in the Starship Gallery. Star Wars Launch Bay Cargo – Guests may bring home high-end artifacts and treasures, including signed memorabilia, studio models and personalized D-Tech on Demand mobile device cases. Star Wars: Path of The Jedi: In the Tomorrowland Theater, guests will relive stories from the Star Wars saga – or discover them for the first time – in this short film compilation. “Star Wars: Path of the Jedi” connects iconic scenes from the films in fun new ways, following the journey of Luke Skywalker. It includes moments from the new movie Star Wars: The Force Awakens. Star Tours – The Adventures Continue: Fans of this popular attraction will experience journeys involving new characters and adventures from Star Wars: The Force Awakens. Based on the Star Wars films, Star Tours takes guests to multiple Star Wars destinations where they interact with characters from throughout the saga. And it is all in 3D. With an eye-popping digital presentation leveraging Dolby 3D to deliver a vivid and realistic experience, a dramatic musical score and motion simulator-based technology, guests are immersed in the Star Wars galaxy like never before on a theme park attraction. Jedi Training: Trials of the Temple: This popular interactive show is being reimagined, and a new version will open in Tomorrowland Dec. 8 with Darth Vader and the Seventh Sister Inquisitor, a new villain from the popular Disney XD series Star Wars Rebels. Hyperspace Mountain: The classic Space Mountain attraction is reimagined as Hyperspace Mountain, thrusting guests into the darkness for an action-packed battle between Rebel X-wings and Imperial TIE fighters. A new soundtrack, inspired by the films’ musical themes, adds to the thrills. Stormtrooper Patrols: In Tomorrowland, guests may to come face to face with First Order stormtroopers who will patrol the area near Star Wars Launch Bay and Star Tours – The Adventures Continue. Galactic Food: Guests will experience Star Wars through their palates, as well, with tasty food and beverages inspired by a galaxy far, far away. The Galactic Grill, in the Tomorrowland Terrace location, will feature a dark side and a light side menu, and Pizza Port will offer new Star Wars-inspired menu items. Season of the Force at Disneyland, along with Season of the Force experiences at Walt Disney World Resort in December and January, will further expand the Star Wars presence at both resorts ahead of the new Star Wars-themed lands coming to Walt Disney World Resort and Disneyland Resort. Also at the Disneyland Resort, guests continue to enjoy the 60th Anniversary Diamond Celebration, with sparkling décor in Disneyland and Disney California Adventure, plus a dazzling array of after-dark shows, all of which are presented nightly. In Disneyland, “Paint the Night – All-New Electrical Parade” creates a river of color down Main Street, U.S.A., with spectacular special effects, sensational floats, energetic performances and unforgettable music. The “Disneyland Forever” fireworks show in Disneyland lights up the resort with dynamic pyrotechnics and magical projections that surround the audience. In Disney California Adventure Park, the magical water, film and special effects presentation “World of Color – Celebrate! The Wonderful World of Walt Disney” pays a fun, surprise-filled tribute to Walt Disney, whose fertile imagination led to the creation of Disneyland. For more information about the Disneyland Resort, see www.Disneyland.com or visit www.DisneyParksBlog.com. These sites are updated regularly. About the Disneyland Resort The Disneyland Resort features two spectacular theme parks – Disneyland (the original Disney theme park) and the reimagined Disney California Adventure Park – plus three hotels and the Downtown Disney District, comprising unique dining, entertainment and shopping experiences. The Resort’s hotels are the luxurious, 948-room Disney’s Grand Californian Hotel & Spa, which also features 50 two-bedroom equivalent Disney Vacation Club units; the magical 973-room Disneyland Hotel – both AAA Four Diamond properties – and the 481-room Disney’s Paradise Pier Hotel with its “day-at-the-beach” fun. For information on attractions and vacations at Disneyland Resort, visit Disneyland.com, call (866) 43-DISNEY or contact local travel agents.